Hey everyone! I know I have been MIA with posts lately, but I have a good excuse. I've been working alot to make some extra shopping money and school is alreading starting to get tough this year. So I am so excited! 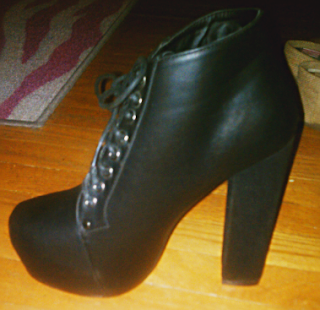 For those of you who have been reading my blog, you know that I have a small (BIG) obsession with Jeffrey Campbell. Well... I was recently shopping and a pair of shoes caught my eye. Lita-look-a-likes! Even better, hey were only $35! So of course I bought them. So some of the differences between mine and the real Litas are the heel. 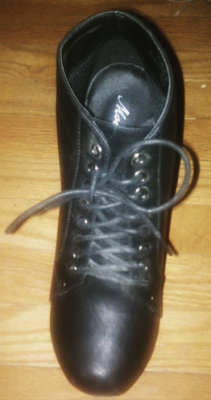 The heel of the authentic Lita is made of wood while mine is covered with velvet. Another difference is the leather. Mine of course is made of pleather. But I am very happy with my purchase. I have been wanting these for a very long time now and haven't been able to save the money up for the real ones. I'm going to be wearing these this weekend to a party and will le you know how everything turns out. So goodbye for now. Let me know your thoughts!